We’re excited to announce an additional purchasing model to the Azure SQL Database Elastic Pool and Single Database deployment option. Recently announced with SQL Database Managed Instance, the vCore-based model reflects our commitment to customer choice by providing flexibility, control, and transparency. As with Managed Instance, the vCore-based model makes the Elastic Pool and Single Database options eligible for up to 30 percent savings* with the Azure Hybrid Benefit for SQL Server. The new vCore-based model introduces two service tiers, General Purpose and Business Critical. These tiers let you independently define and control compute and storage configurations, and optimize them to exactly what your application requires. If you’re considering a move to the cloud, the new model also provides a straightforward way to translate on-premises workload requirements to the cloud. General Purpose is designed for most business workloads and offers budget-oriented, balanced, and scalable compute and storage options. Business Critical is designed for business applications with high IO requirements and offers the highest resilience to failures. You want the freedom to choose what’s right for your workloads and we’re committed to supporting the DTU-based model alongside the new vCore-based option. Looking for a simple way to purchase and configure resources? The DTU-based model provides preconfigured bundles of resources across a range of performance options. If you are not concerned with customizing the underlying resources and prefer the simplicity of paying a fixed amount each month, you may find the DTU-based model more suitable for your needs. However, if you need more insights into the underlying resources or need to scale them independently to achieve optimal performance, the vCore-based model is the best choice. The vCore-based model is also a good choice if you own SQL Server licenses that you would like to move to the cloud. Migration between DTU-based and vCore-based performance levels is a simple online operation and is similar to the current process of upgrading from the Standard to Premium service tiers. Save more on vCore-based options when you use the Azure Hybrid Benefit for SQL Server. This benefit is exclusive to Azure and enables you to use your SQL Server Enterprise Edition or Standard Edition licenses with active Software Assurance to pay a reduced rate on a vCore-based Single Database, Elastic Pool or Managed Instance, with savings up to 30 percent. The new vCore-based service tiers are available in most Azure regions and you can start using them immediately. To learn more, check out the latest availability. If you already have an Azure SQL database, you can switch to the new service tiers in the portal and configure the database as illustrated by the following diagram. Otherwise, you can create a new database in the General Purpose or Business Critical service tiers. Some regions may not offer both compute generations. For example, Gen4 is not available in the newest Azure regions. For more information about the vCore-based purchasing options visit our pricing pages and purchasing model overview. For more information about the regional restrictions visit the resource limits documentation. *Savings based on a 8 vCore Business Critical Managed Instance in East US Region, running 730 hours per month. 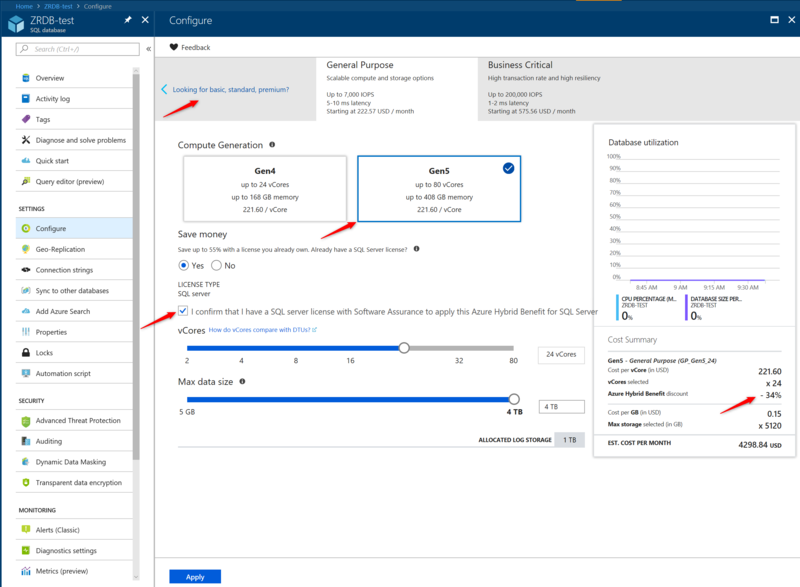 Savings are calculated from full price (license included) against reduced price (applying Azure Hybrid Benefit for SQL Server), which includes the Software Assurance cost for SQL Server Enterprise edition. Actual savings may vary based on region, performance tier, and Software Assurance tier. Prices as of December 2017 are subject to change.